Goods remain the property of Jervisbay Barbecues Ltd. until payment in full is received. Items sold are non-refundable. Full price items may be returned within 7 days of purchase for exchange or store credit. No exchange without original receipt, and goods must be in original packing. Pick up/delivery charges will apply. Discounted items are sold in an ‘as-is’ condition and are non-returnable, non-exchangeable. Hungering for the ultimate barbecue? Then Jervisbay will satisfy your deepest cravings – a unique environment dedicated to the finest in barbecue equipment, accessories, recipes and ingredients. We offer the exclusive and the extraordinary to create an entirely new experience. From our Hong Kong base we serve retail customers as well as corporate and hospitality clients throughout Asia. Jervisbay was inspired by the healthy outdoor lifestyle of Australia with its emphasis on fresh flavours and all-natural ingredients. We stock all things barbecue – from top-of-the-range outdoor kitchens to portable picnic barbecues; from hickory chips to eco-friendly bamboo skewers; from Australian marinades to New Zealand condiments to fiery Chilli wine…everything you could possibly need for the ultimate tastefest. Burnt sausages are out, barbecue cuisine is in. In recent years, barbecuing has undergone a revolution – especially in Australia. The old stereotype of a fat bloke with a can of beer serving up blackened sausages and burgers has been replaced by an altogether more wholesome approach. At Jervisbay we fully champion the new emphasis on healthy, flavoursome cuisine – and the myriad culinary possibilities that outdoor cooking allows. 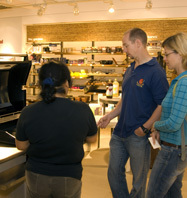 Our store will give you the tools and inspiration to create gastronomic magic. Why not try salmon cooked on fragrant cedar wood planks, succulent herb-rubbed lamb, juicy lemongrass and ginger prawns, or crispy duck with chilli and capsicum jam? Jervisbay is inspired by the healthy outdoor lifestyle of Australia, with its emphasis on fresh flavours and all-natural ingredients. We are 100% committed to healthy cooking practices, and environmentally friendly products – principles that guide us in deciding which product and ingredient to stock. We also provide the complete environment with tableware, picnic products, and every accessory to celebrate the lifestyle.